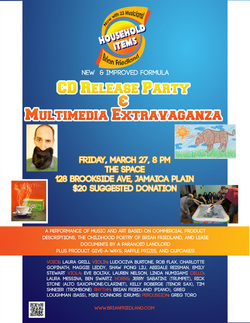 3 bands and 2 comedians combine powers to create an evening of non-stop entertainment at The Space, where listeners will encounter bountiful comfy couch seating, friendly dogs, and delicious cupcakes (or other homemade desserts). BYOB. $15 suggested donation. Performing the roles of four musicians and their instruments, Kelly Roberge aims to explore the social dynamics of being in a band. The result is sketch comedy with music in the style of hip-hop and R&B. 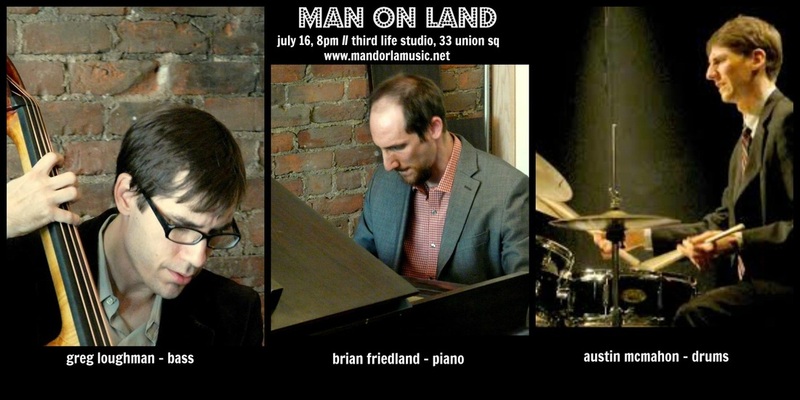 Composer/pianist Brian Friedland creates dramatic songs utilizing unusual sources of texts for lyrics and musical inspiration: snack food, wine bottles, energy drinks, his childhood poetry, and a lease from an overzealous former landlord. The Super Band instrumentation of vocals, rhythm section, and sting quartet creates a large palette to explore the many emotional nuances of Friedland's chosen texts. Complimentary drinks and homemade snacks!